Epiphytes are “air” plants, including moss, that survive on moisture and nutrients in the atmosphere. 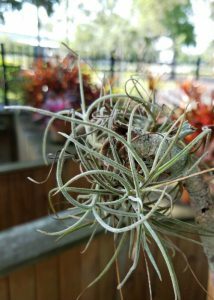 Several epiphytic plants, like Spanish moss, ball moss, and lichen, are common to the Florida landscape and the southeast United States. People unfamiliar with epiphytes sometimes worry that they may cause injuries to plants. Epiphytes are plants that live on other plants but do not harm their hosts. 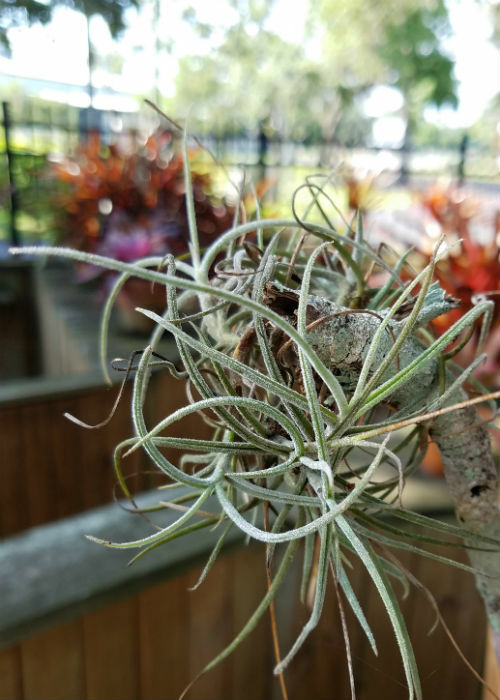 Often called air plants, epiphytes attach to the bark of their host plants as a means of reaching sunlight or to avoid competition on the ground. The most common epiphyte seen in Florida is Spanish moss—not a true moss, but a member of the bromeliad family. Another misconception about Spanish moss is that it harbors a biting insect commonly called a chigger or redbug. The natural habitat of these creatures is mostly low, damp areas with heavy natural vegetation. Fallen moss—and any plant material on or near the ground—may contain chiggers, but moss in trees hanging above the ground rarely harbors them. Many animals use Spanish moss for protection, taking cover in its thick masses. A number of insects and other invertebrates hide and breed in Spanish moss. Two species of bats use garlands of Spanish moss as day-time resting sites. Zebra longwing butterflies roost in it at night. Many species of birds use strands of moss to build their nests. While epiphytes may grow on wires, fences, and other non-living structures, they are particularly well-adapted to well-lit, moist habitats commonly found near rivers, ponds, and lakes. Epiphytes will also grow in areas where the humidity is fairly high. Epiphytes do attach themselves to plants, but they do not harm the plants, unlike mistletoe, a plant parasite. Without soil as a source of nutrients, epiphytic plants have evolved the capacity to obtain minerals dissolved in water that flows across leaves and down branches. EPIPHYTES ARE NOT PARASITES! Do not remove them from your trees. They are an important part of the ecosystem and afford many ecological benefits, such as providing food, water, and shelter to Florida animals. Trees that seem to be overrun with Spanish or ball moss are usually in a state of decline due to other reasons; the epiphytes are just taking advantage of the high perch that offers them the best sunlight.